On February 17th of 2010, Brennen was scheduled to have his first orthopedic surgery - bilateral heel-cord releases, where they cut the tendons to lengthen the muscles in his legs that had become shortened and tight. I was a nervous wreck that morning, as I sat with Brennen in the surgical waiting room. I knew that he would be in good hands, and that he would be given the best possible care, but as a mother, you just hate to send your little one into the operating room. It is a hard thing to do and it never gets easier. The emotions are overwhelming. In the waiting room that same morning was another young boy in a wheelchair who looked to be a year or two older than Brennen. He was with his family, dressed in the same hospital gown that Brennen was wearing, and awaiting his own turn in the O.R. I remember looking at his mother, wondering if she was feeling what I was feeling, and how she was managing to keep it all together. I remember staring at her little boy, as so many strangers have stared at my son, only not out of pity but out of love.. love and concern and a deep understanding for what we were all about to go through. Though we exchanged many glances that morning, we did not speak. As her son was called in and she gathered their things, our eyes met and we smiled. Smiles that held so much more than words could say at that time. Smiles full of courage and comfort and a connection between two mothers on a very similar journey. That little boy was Nathan, and this is his story. 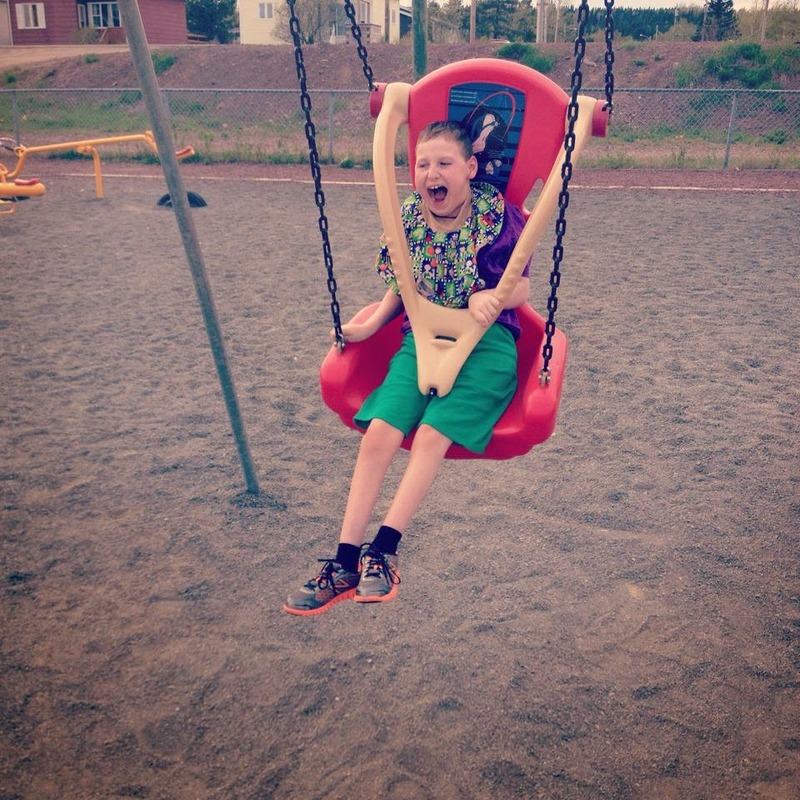 Nathan was born at the Central Newfoundland Regional Health Centre in Grand Falls on January 3, 2003. He was two weeks early, weighing 6 lbs 4oz and was 21 inches long. I remember we had to buy preemie outfits for him because he was so tiny. Though he was almost an average size, he seemed so small to us. Looking at him today, you would never say that he was premature. At a whopping 100 pounds and 5'4" tall at only 11 years old - he's quite the brute! We had no idea that Nathan had any health issues until January 2, when I went in for a routine check-up. I explained to my doctor that I hadn't been feeling a lot of movement so she wanted to do a stress test to make sure everything was still fine. It wasn't. The baby was in distress and I was immediately admitted to the hospital with a biophysical ultrasound scheduled for the next morning. I know, you are probably thinking, "Why the next day? ", and that's a question we often ask ourselves. I wonder if things would have been different if they had done something right away, but we cannot go back in time, and I don't know that I would want to. The biophysical ultrasound showed that he had only a small pocket of amniotic fluid by his nose. Other than that, he was completely dry! 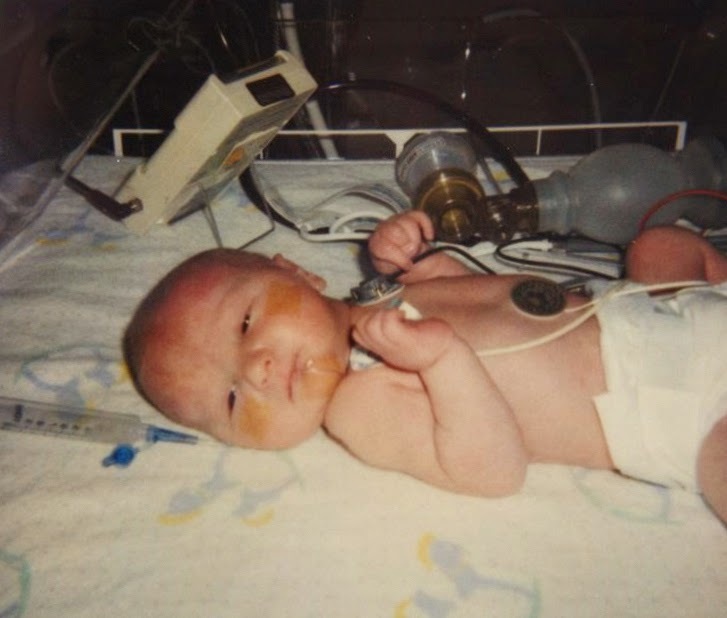 It was determined that they needed to take the baby right away, and so Nathan was born by emergency c-section at 10:10 in the morning of January 3, with zero blood sugar and high blood pressure. After numerous tests and a week long stay in the hospital we were supposed to be going home. I was packing up our room when one of the nurses came to check on him and noticed that he looked a little "dusky". She swooped him up right away and took him for oxygen. More tests followed and before we knew it, we were airlifted to the Janeway Children's Hospital in St. John's thinking that he may have a hole in his heart! There was so much confusion. I didn't know what was happening or what all of this meant for my baby boy. Our stay at the Janeway was an incredibly difficult time in our lives. We saw so many doctors and nurses who were all fabulous and they truly don't get enough credit for the work they do every day! Being in the hospital with your baby you see so many things that are sad, amazing and beautiful, all at the same time. You realize as a parent that you really are quite lucky to be blessed with the child you have been given. 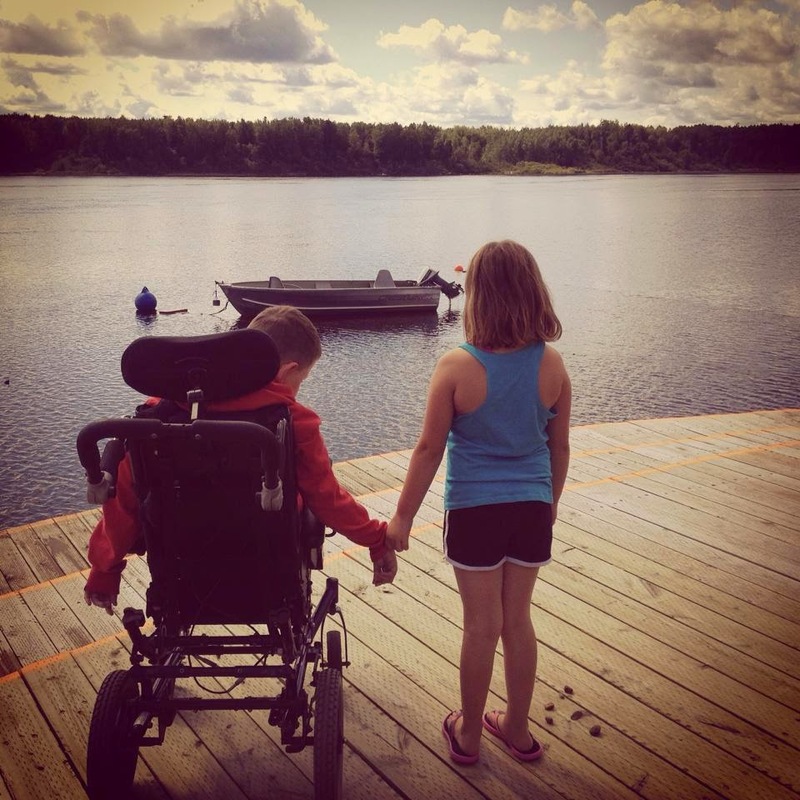 In time you will understand that all things happen for a reason and that special children are only given to special parents that can make their lives exceptional! We have been very lucky with Nathan. He is generally very healthy and does not have a lot of medical issues. 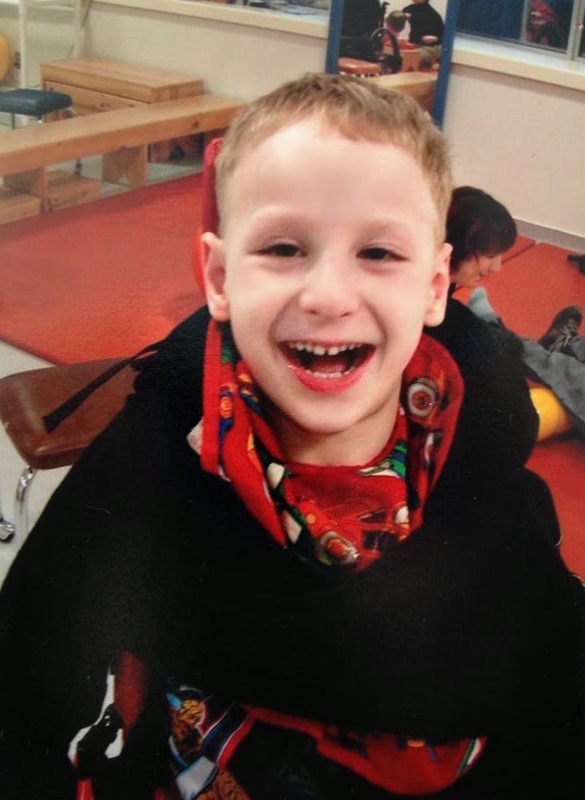 He has had several surgeries, and we come to the Janeway regularly for CP clinic, but other than that he has been well. Although Nathan's communication is mediocre at best, we understand him completely. He is very patient with us and will repeat himself over and over until we understand what he is trying to say. Having even some form of communication is huge when dealing with common everyday things like being hungry, thirsty or sick! When I started to write Nathan's Tulip Tale, I recalled the first time I saw Julie and her family. Nathan was having a tendon release done, and it was his first surgery! I remember wanting to talk to her so bad because I had never met or talked to another young mother in the same situation as us! Someone who knows all my feelings and emotions because she no doubt shared them! We didn't talk, we just looked at each other knowing mother to mother what was to come. It was going to be a long road for us. We did exchange email addresses and have been in contact from time to time ever since! 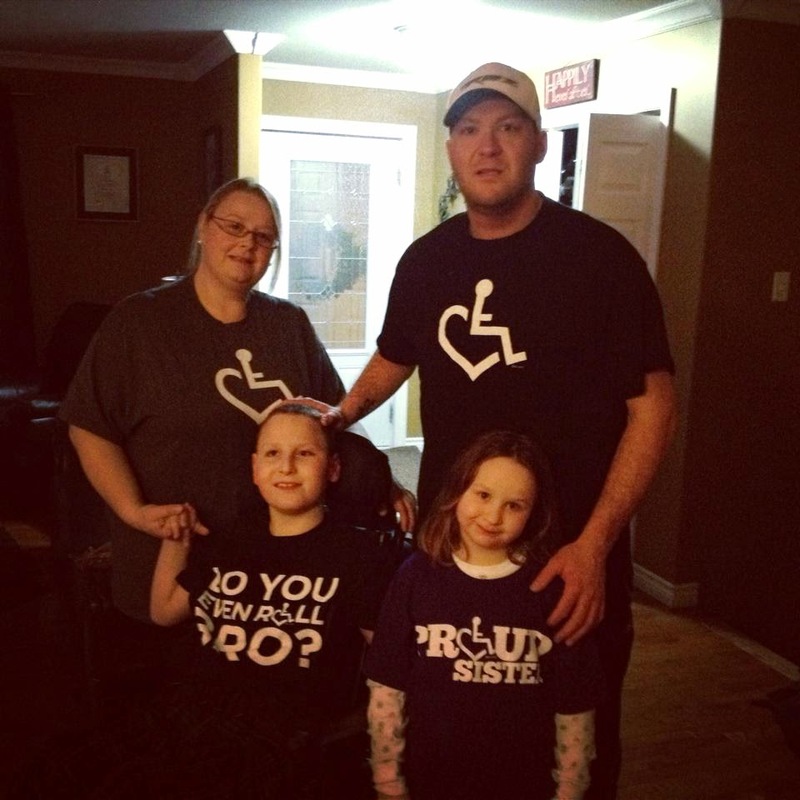 I am so full of gratitude for the work that she is doing, bringing awareness and acceptance to cerebral palsy! Brennen must be a very proud little boy that his mommy is such a wonderful person. Today Nathan is eleven years old! He is a happy, funny, easy going, laid back young man! He loves his family and friends, loves school, being outdoors, and going to the stadium. Whether it is to watch his little sister play hockey or for him to skate, guaranteed he will always have a plate of fries and gravy at the rink. If there's one thing Nathan loves it's food! Our family is unique and special. Although we have different obstacles and challenges than other families, we wouldn't change our lives for anything in this world! 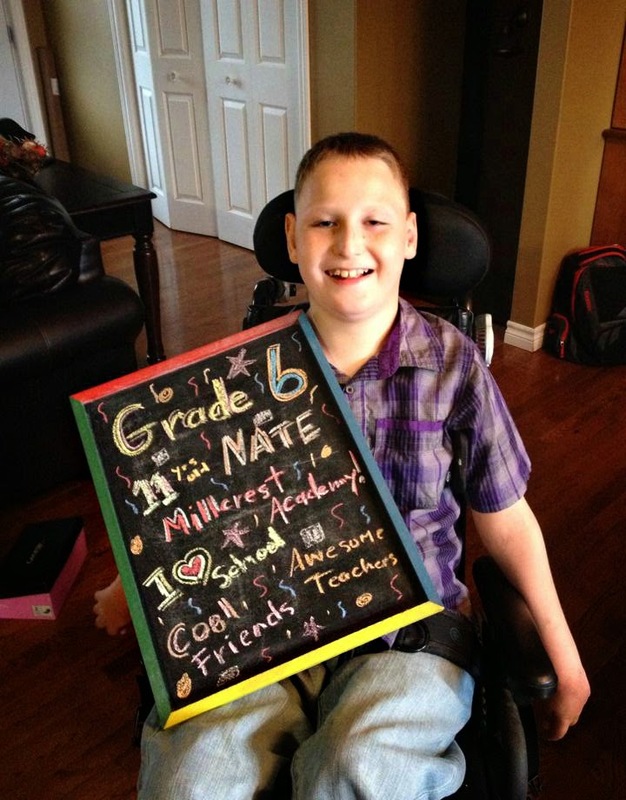 Amy, thank you for sharing Nathan's story! I have to tell you, I filled up when you talked about that day in the waiting room. It's funny how we both felt exactly the same way. I am so glad that we connected and have been staying in touch ever since. Nathan is such a handsome boy and he has such a happy, loving family. You are truly blessed. I just love the picture of him on the swing! OMG.. the joy on that child's face!! I do feel like we are on a very similar journey, and having someone like Nathan to look up to makes me less afraid of our future. He and Brennen are so very similar, and if they both keep going the way they have been, things are gonna be just fine!